The following method will give you a good place to start from. Holding your arms out to the sides, measure your full armspan,from fingertip to fingertip. Next, measure the distance from your elbow out to your fingers. Add the two measurements together and this length should give you a good indication of your maximum paddle length. For those paddling a wider kayak, say 24" and above, you may go slightly longer. It is rare that I build paddles beyond 225 cm in length. Many people may wish to go a little shorter however, especially if using a more high angle stroke. Email me for more details and with any questions. 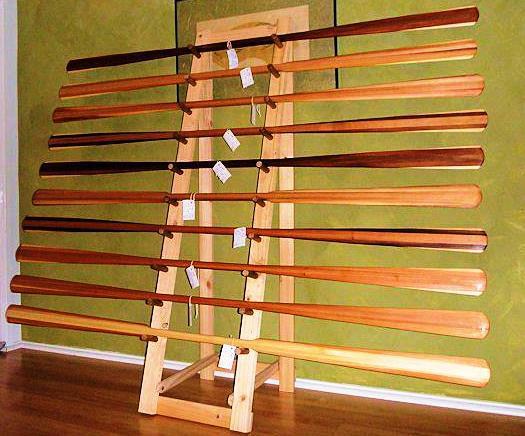 90% of my paddles come in between 210cm and 220cm, usually around the 213-218 cm range. I build my paddles to be between 3.25 and 3.5" in width at the widest point. For those with very small hands, you will want to go even narrower. You should be able to comfortably hold the paddle in your hand from the widest point. For those of you with large hands, you still should not normally go over the 3.5" maximum. By special request, any size width can be special ordered. I build my looms roughly 1.25 wide and 1.5 inches thick. Smaller hands may require smaller looms but you will lose a bit of strength. Our 2-piece Greenland Paddles, looms will be 1.25"by 1.25", rounded to fit our carbon fiber ferrule system (we upgraded our ferrules again in March 2012 and we think you will like the new look). For the length of the loom before it starts tapering out for the blades, stand with your arms hanging down at your sides completely relaxed. Bend your elbows 90 degrees, knuckles facing up, maintining the same width between your hands. Form a circle with your thumb and forefinger on each hand. This is the distance for a custom loom length. I normally build looms in the range of 18" to 21", mostly on the shorter end of that range. Some people tend to prefer inches as a means of measurement whereas other prefer centimeters. Here is a quick list of conversions from inches to centimeters. My paddles for kayaking will be measured in centimeters whereas my canoe paddles will be in inches. Inches are rounded off to the nearest half inch.